Insomnium is a Finnish melodic death metal band from Joensuu, Finland. 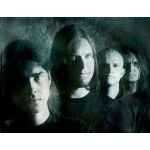 The sound and lyrical themes of their music portray darkness, sorrow, loss, pain, and nature. Although they are primarily a melodic death metal band, their tracks could be seen as reminiscent of doom metal and progressive metal.